How to Leverage Big Data in Your Marketing Strategy? No doubt data in general, within the field of marketing, is becoming more important. I’m not even talking about big data here, just data. As big data was reaching fever pitch sometime between 2011 and 2014, today the cool kids in data are moving on to obsessing over AI and machine intelligence and deep learning. The basic idea behind the phrase ‘big data’ is that everything we do is increasingly leaving a digital trace, which we can use and analyse. Early adopters have experimented with big data, with mixed results. They had to work with big data startups, and cobble solutions together. Today, these early big data startups went through multiple VC financing rounds, scaled their organizations, learned from successes and failures in early deployments, and now offer more mature, battle-tested products. Is big data really sounding “3 years ago”, or has big data matured and is it more usable for marketers today ? That’s the question I want to answer in this blog post. What is big data for marketers? And what it is not? A lot of people think big data marketing is all about the sheer volume of data. That’s because most of the big data use cases and examples are from big companies, cities, hospitals, governments, and the likes. These type of organizations obviously have big amounts of data. But in truth, you can do big data marketing even if you don’t have that much data. activity data: simple activities like listening to streaming music, or reading a book are now generating data. Your smart phone collects data on how you use it and your web browser collects information on what your are searching for. Your credit cared company collects data on where you shop and your shop collects data on what you buy. You visit content hubs of brands that collect data on what content you like, and what not. conversation data: our conversations are now digitally recorded. Think of email, social media conversations and even many of our phone conversations are now digitally recorded. Private data from instant messaging and private messaging networks are also part of this group of data (iMessage, WhatsApp, Snapchat, etc). photo and video image data: 100s of thousands of my photo’s are on iCloud, Google Photo’s. The increasing amount of CCTV cameras take video image, and we upload hundreds of hours of video image to Youtube every minute. sensor data: we are increasingly surrounded by sensors that collect and share data. Think of your smartphone containing sensors that track your location, your speed and direction at which you are traveling. Think of the Fitbit-type of wearables you wear which monitor your sleep and exercise patterns. And with the rise of IOT or Internet of Things, just about everything will contain sensors and collect data related to you and me. Big data is more about the customer than about the product. It’s about understanding, identifying and addressing customers needs with the right message, product or service, at the right time, in the right channel. This sounds very much like classic marketing, in which you do your market research, then build your campaign, run it, and wait for the results to come in, after which you optimize. Customer insight and Unique personas: while “in the old days”, we had to create buyer persona’s in a manual, slow and cumbersome process, big data is capable of providing massive insights into consumer behavior, which can be translated on the fly into unique personas and better understanding of the aspirational audience of any brand. This allows us to personalize better, segment better, and be more relevant in general. Big data marketing is about agility. It’s about moving away from campaign mentality to continuous programs, agile testing of ideas, and continuously optimizing messages. And this is the really, really big advance that should matter to every marketer. Predictive & prescriptive actions: through the analysis of old customer patterns we can now forecast customer behavior and deploy marketing activities that adapt to market conditions. Conversation data, sensor data, historical and activity data can all be combined to fuel predictive analytics and prescriptive actions. Improve marketing performance: Enhanced Look-Alike Modeling and Intelligent Retargeting techniques combine anonymous behavior data with existing customer data to personalize the messaging and be more contextual relevant, or to carve out a more profitable customer segment that you want to focus on. By linking customer profile information to outbound marketing campaigns, companies can suppress ad messages to individuals unsuited for an offer. This step eliminates the waste of spending marketing dollars on people who have already become your customer or have little likelihood of taking you up on your offer. How can marketers use big data today ? Data analysis in marketing is well-established. But marketers today have access to much more data beyond the data they own. They have access to a vast amount of proprietary and public data about customer behavior, usage and preferences, representing a potential gold mine of customer insight. But that’s a bit too granular for me ! What I’m interested in is: what can marketing do with big data, today? 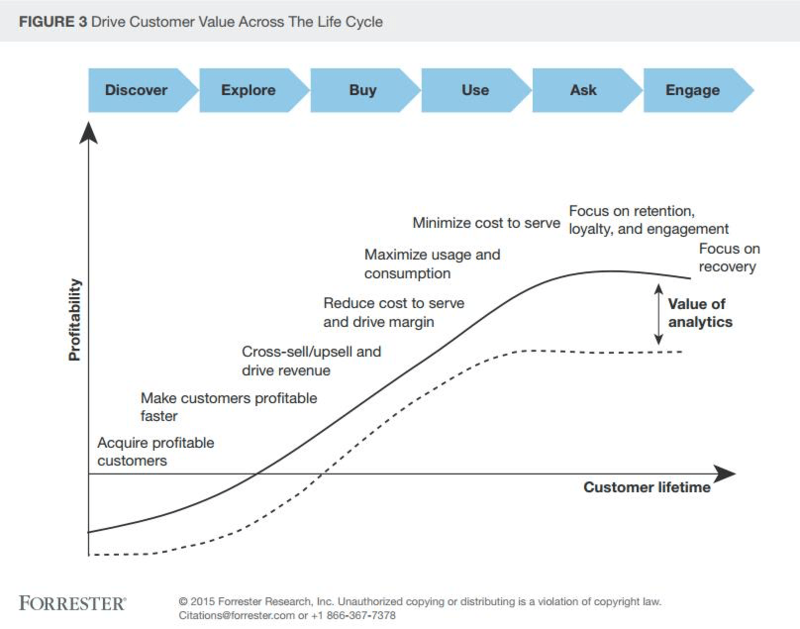 Forrester made an interesting overview of where big data provides value along the customer lifecycle. The graphic is part of a white paper on “How Analytics Drives Customer Life-Cycle Management” from a SAS-sponsored Forrester study. Discover the right new customers: through automatic segmentation, and customer look-alike analytics and targeting you can reach the right prospects. Offer/contact optimization: by analyzing customer responses to messaging and offers, you can adapt your offering depending on the segmentation data of your contacts. Additionally, you can analyze the best time to contact customers and adapt accordingly. A/B and multivariate testing: albeit nothing new and in use by many marketers today, this remains a good tactic before rolling out initiatives on a large scale. Cross-sell, up-sell and affinity models: customers build a history of interactions through service requests, product use, and other communications. You can use this insight to fuel product recommendation to customers, or products recommendations for account managers if that makes sense for your business. Predictive Content Recommendations: machine learning and big data auto-discovers and map all of your content assets, learns which content works best and for who, and recommends relevant content to web visitors and leads. Predictive lead analytics and lead scoring can prioritize incoming lead, help you acquire high quality leads and grow existing customers. Algorithms from Lattice Engines combine internal data with external buying signals, using machine learning they can link up with your marketing automation system to segment and trigger automated campaigns in real-time. Churn and Loyalty models: using big data, specific strategies can be developed towards most profitable customers, predict customer churn, and counter churn with churn campaigns. There are probably much more use cases, so feel free to add them in the comments, or pop me an email and I’ll add them here in the list. 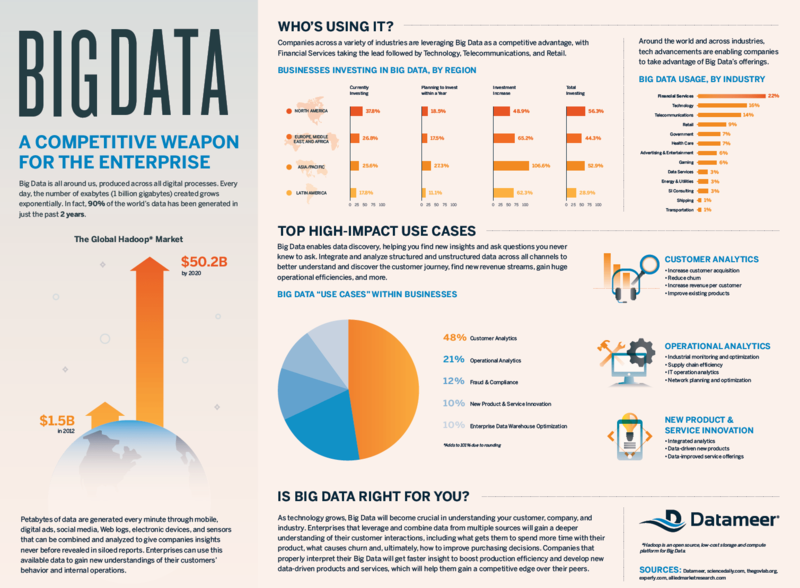 A high level view of Big Data for the Enterprise, created by Datameer, December 2015 (click to enlarge). Despite all of the promise, there are limits to the usefulness of big data analytics in its current state. The most significant of these is the complex “black box” nature of analytics techniques and tools, which can make it difficult to trust and understand the output of big data approaches and to convince others of the value and accuracy of the insights the tools produce. Big Data, fundamentally, is… plumbing. Certainly, big data powers many consumer or business user experiences, but at its core, it is enterprise technology: databases, analytics, etc: stuff that runs in the back that no one but a few get to see. And, as anyone who works in that world knows, adoption of new technologies in the enterprise doesn’t exactly happen overnight. Big Data applications in sales and marketing help with figuring out which customers are likely to buy, renew or churn, by crunching large amounts of internal and external data, increasingly in real-time. The interesting evolution here is that these big data native applications increasingly come “in a box”, without having to actually deploy a Spark or Hadoop “assembly line” yourselves. Examples are 6sense, SailThru, ActionIQ and much more of the “application” players you can find in the big data landscape of 2016 below. Where is all of this going? I don’t know really. The only thing I know is each and every customer project I do is has more and more to do with data. Marketing is increasingly becoming a technical discipline, on top of all the existing classic marketing expertise around branding, messaging, positioning, pricing, and so on, which are still needed. Really a lot of education is needed to bring business leaders and marketing leadership up to speed on the opportunities, and risks of using big data in marketing. Data will only increase in size. The upcoming General Data Protection Regulation or GDPR 2018 in Europe, which deals with compliance, privacy, and internet laws will become a big challenge for marketers. As new technologies and platforms emerge, we will continue to see a shortage in talent that can work with these innovations. New buzzwords like cognitive computing and artificial intelligence are entering our world. The ability to teach and apply human thought processes to machines will open up new opportunities for marketers. The only question is: you can add all the intelligence you want, but how will you remain relevant for your customer?